You've just completed your best training ever (you think), and now you're waiting for the results. Your concern is that previous trainings have resulted in early lifts in job performance, but that after a few weeks job performance declines to pre-training levels. It's disappointing to have all your good training show encouraging performance improvement early-on only to have it lose steam a month down the road. What can be done? My first reaction might be to quote the famous Zig Ziglar. When told that results from his motivational techniques didn't last long, Ziglar replied, “Neither does a bath. That's we we recommend that you take them daily.” While there is definitely truth to the notion that training needs reinforcement, there are other strategies and tools that can result in long term performance gains. Gawande provides several *examples from the medical field, but I think his most compelling examples come from his work and research with airline pilots who routinely use checklists whenever they climb into the cockpit. This is a profession that requires the use of extraordinarily complex and powerful equipment, where errors could cost the lives of hundreds of passengers. Pilots are skilled and highly trained individuals who are required to develop expertise in a variety of disciplines. Therein lies the problem. Without a structured process; without cues, prompts, and guidance; pilots would be lost in a maze. 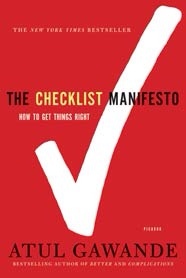 Here's where the strategy of the checklist comes into play. The checklist doesn't replace a pilot's knowledge or ability. Airline checklists merely create a framework that organizes and categorizes flight procedures so that a pilot can engage his skills in an orderly fashion that will help him get an airplane safely to its destination. 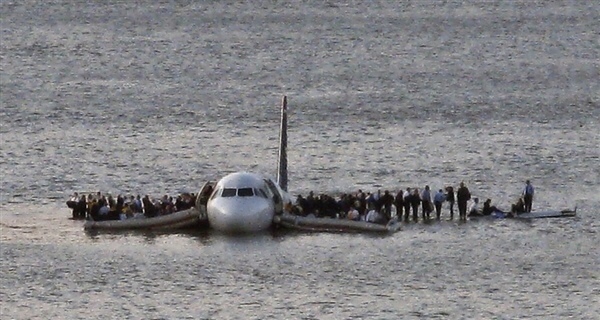 The most famous and successful example of skillful piloting that involved a checklist is Captain Chester “Sully” Sullenberger's landing of US Airways Flt 1549 in New York's Hudson River on January 15, 2009. The checklist didn't give Sullenberger any knowledge that he didn't already possess, but it certainly helped him assure the safety of 155 passengers and crew members. Now, if checklists can be so useful to surgeons and pilots, why don't we see if they can't be applied to our more mundane day-to-day training situations? While what we do may not be life-or-death it's important to us nevertheless. Checklists won't make your training any better, but it may help your trainees implement the training better in the long term. 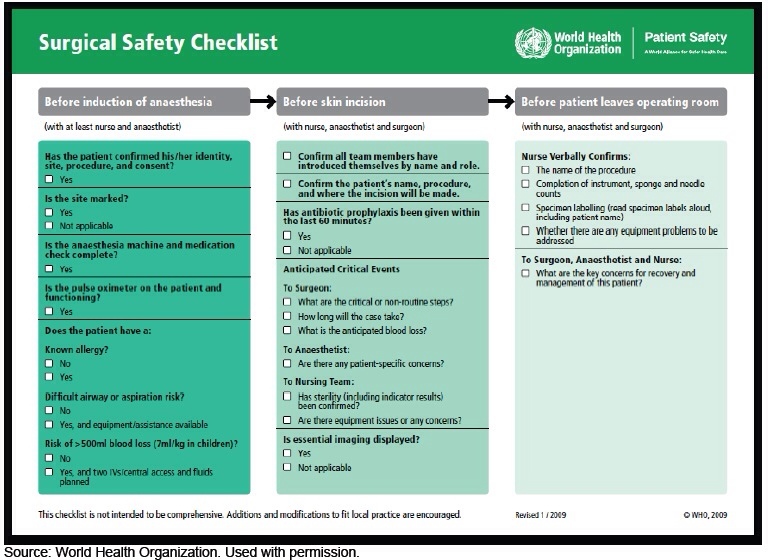 *Here's an example of a surgical safety checklist from the World Health Organization. Click on the picture to download the pdf. This entry was posted in training and tagged Atul Gawande, checklist, education, efficiency, ideas, improvement, learning, sales training, training, Zig Ziglar. Bookmark the permalink. The first is centered on training and the thoughts above rightly point out that training can fade away if not reinforced. An add-on to training can and probably should be performance management. This is the science of bringing out the best in people. Ongoing effort must be expended to provide positive reinforcement for wanted behaviors and either consequences or extinction (saying and doing nothing) to unwanted behaviors. For example providing positive reinforcement to someone who received training that is new to them as they work to apply the concepts learned will help to serve as a way to internalize the concepts. But someone who already knew the material and took the initiative to help another understand it ought to be positively reinforced, Individuals ought to be positively reinforced, not teams. The second thing that comes to mind is a very useful list, than began with the activity to develop the list. For a number of days, for a few minutes each day, write down positive things that are inherently the person developing the list. These are not things that anyone can do, such as plant a tree, but things that are part of him or her. For example, one can see humor everywhere and can make people laugh. Then, carrying the list of 12 to 15 things around with them, every time he or she feels negative thoughts creeping in, reviewing the list will chase the negatives away simply because us people can thing of only one thing at a time.